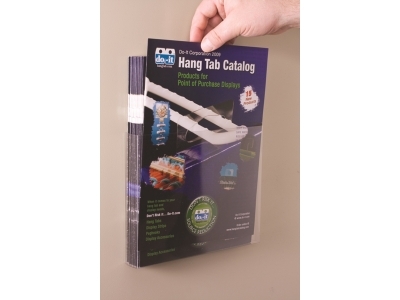 When looking for ways to draw attention to a product, literature displays from the Do-It Corporation can help sales for that product, old or new. A hands-on way for your customers to see brands available, products offered, and more, literature within the right holder works wonders. Do-It has years of experience designing and crafting display solutions to benefit retail businesses, and, with our capabilities, you know you’ll get an answer to your display problems that you can depend on. One way to encourage customers to purchase products with literature displays is by presenting them with manuals for products that may be difficult to understand. By seeing the instruction manuals for products like vacuum cleaners, deconstructed furniture, and more, customers will not only dispel any doubt they had about whether they’d be able to use the product, but also see the capabilities of the product in a list in front of them. Usually found in the electronics section of retail stores, warranties are another great way to push purchases by giving customers peace of mind. Literature displays, put in the right location, can bring visibility of warranties for high-price products to customers who may be looking for a way to feel more secure with their purchase. Warranties not only help you push sales for the product itself, but the warranty also can bring in a little extra with every sale! Another great way to bring in buyers is coupons, and by placing a literature holder by the product with special offers, you can continue to bring in sales with ease. Whether it’s your full weekly catalog of deals or a single coupon, Do-It can make the right size for your store. If product awareness is what you desire, Do-It’s line of products can help bring attention to a variety of items through effective display solutions. With the literature displays from Do-It, you’ll get the right information to the right people every time.